We love how downtown gets ready for the holidays and below we assembled a list of public, outdoor holiday events for you to consider attending or visiting. 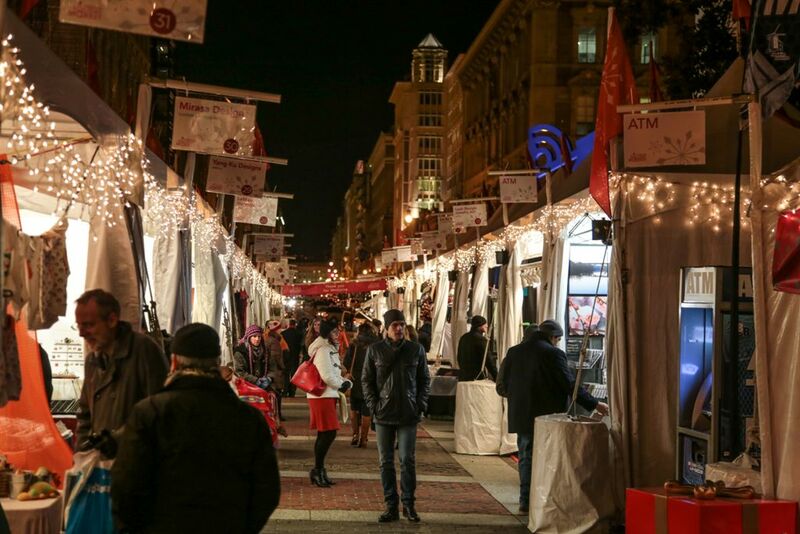 1) Downtown Holiday Market (F St NW between 7th and 9th Streets) – This now annual event is a market filled with artisans selling their wares, food vendors, and live entertainment. We always find a holiday gift for our loved ones at this market and take in a performer or two while enjoying the mini donuts and hot chocolate. 2) *NEW* CityCenter Tree Lighting (The Park at CityCenter (I Street at 11th St NW)) – This is a new event because CityCenter is new so we don’t know exactly how this will turn out but we suspect it will be quite enjoyable. There will be a performance from the Gay Men’s Chorus of Washington and two soon to be opened food retailers will be handing out samples including hot cocoa from Rare Sweets and hot tea from Mango Tree. A non-perishable food collection will take place for the DC Central Kitchen where donors will be entered into a raffle to for a chance to win gifts from CityCenter retailers. 3) Macy’s Holiday Windows (1201 G St NW – between 12th and 13th Streets) – The annual holiday windows are on and working on the G Street side of Macy’s in downtown Washington. They were unveiled last Saturday and while they’re not as good as some of the New York City window displays they are indeed all our own. We cover these most every year. Don’t forget the Capitol Christmas Tree Lighting (Tuesday, December 2) and the National Christmas Tree Lighting (Thursday, Dec 4) also. The latter invariably gets a national act to perform and traffic is jammed in downtown that afternoon. Nanci Dean Thibault liked this on Facebook. Mindy Cavicchia liked this on Facebook.